Wavepad is a very well-designed and extremely flexible sound editor for the Windows operating system. It functions both as an audio recording AND an advanced mixer which functions perfectly if you're wishing to convert those old record LPs and tapes to a digital format like MP3 or OGG. As the freeware version of Wavepad, this version can grab audio from various sources including those from your PC microphone inputs and TV tuners cards.. anything that Windows can hear, so can the Wavepad Audio Editor. Wavepad Audio Editor 9.10 is a shareware program and can be used as a demo to try the software until the free trial period has ended. A full version of the program is available after the trial period ends. 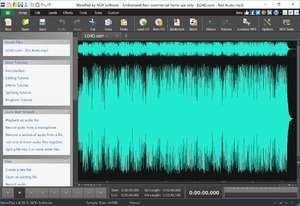 For security reasons, you should also check out the Wavepad Audio Editor download at LO4D.com which includes virus and malware tests. Additional screenshots of this application download may be available, too.